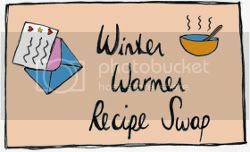 All The Live Long Day: Winter Warmer Recipe Swap - Last Day To Sign Up! I'd like to say than you to everybody who has signed up to Fiona's and my recipe swap already. It looks like it's going to be good! If you too would like to take part, you still have time till midnight today to throw your name into the pot. (That's midnight London time, people). This swap is friendly and low cost, and apart from getting a brand new recipe for your collection, you will be sure to meet some new blog friends and become part of a little food-loving community. You can check out all the details here. Fiona and I were trying to give everybody some inspiration, in case you think you might be stumped for ideas on what to swap. Read Fiona's yummy food post or have a look at my favourite recipes from They Draw And Cook. You can sign up for the swap here or here. We'd love to get a few more joiners. Go on, you know you want to!